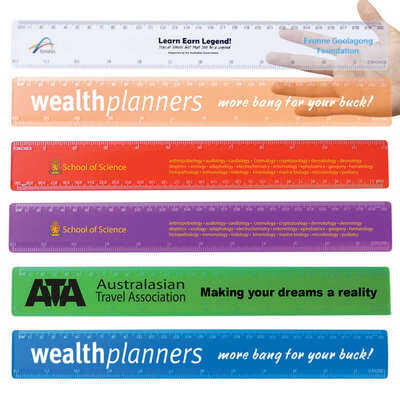 30cm matte transparent premium ruler with metric/imperial calibrations. Colours - Frosted Clear, Transparent Blue, Transparent Green, Transparent Orange, Transparent Purple, Transparent Red Size - 315 x 41mm (LxH) Decoration Area(s) - Pad - Screen Print : Front - 295 x 23mm (LxH); 4CP Digital Direct Print - Small : Front - 200 x 20mm (LxH); 4CP Digital Direct Print - Large : Front - 295 x 23mm (LxH). Price includes : 1 Col 1 Pos Print. Setup is included.